quickly, there is no risk of broken tablets and the number of raw materials used is reduced since binding components are no longer needed. The appearance of the product is in line with the growing segment of detergent pouches. The unique phosphate-free formula with active oxygen power and a multiple enzyme system easily removes grease and dirt and leaves dishes sparkling clean. Several types of recipes, both regular and all-in one, in different quality levels are possible. We offer eco-friendly products certified with European Ecolabel or Nordic Ecolabel. The stringent criteria guarantee the product’s performance and a reduced environmental impact. Furthermore we are able to produce sensitive products, without perfumes and/or colorants. We offer a wide range of packaging options; boxes, (resealable) pouches and buckets. Related to the weight of the pods, we are able to vary from 12 to 20 grams. 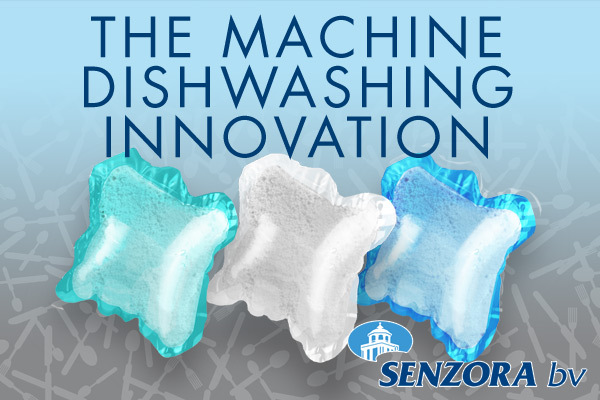 Low weight dishwasher pods give you the option to enter the growing market segment of single and small households who use small dishwashers and/or short washing cycles. Did you know that a dishwashing machine needs to be cleaned every month to make sure it’s running at its best? For a complete dishwashing range we also offer machine cleaner pods. These pods clean, freshen and help maintain dishwashers while cleaning even the hidden parts! Curious about the possibilities for your company? We will gladly inform you about it.